Three teachers walk into a bar, onto the stage, plug their instruments in and then… they melt your face. “Hold Tight, I’m Flying”, will be released on August 1st, 2015. Produced by Lisa Pimentel and mixed by legendary Bob Marlette (Rob Zombie, Black Sabbath, Filter, etc. ), this new album is heavier and more complex, but just as bold and unapologetic as their first two, “Trophy Wife” and “Dear Youth”; both available on ITunes and CDBaby. NSC’s animated, edgy and break-neck live show both invites you in and calls you out, all while you sing along to the fresh, yet familiar, refrains of their carefully constructed songs. Their glamorous matching dresses and bona fide command of the stage will have you leaving at the end of the night a little hoarse, with a smile, and a warm fuzzy feeling. In 2014, NSC released their LP, “Trophy Wife”, toured both east and west coasts and played three shows at SXSW. In 2015, along with their frequent California shows, tour plans include Colorado, the Midwest, and East Coast. MY NEW FAVORITE ALBUM!!!! 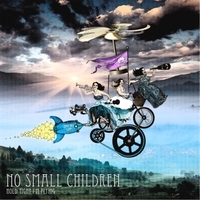 I'VE RECOMMENDED NO SMALL CHILDREN TO ALL MY FRIENDS, AND LIKE ME, THEY ARE FREAKING OUT OVER THIS AMAZING BAND!! I CANNOT WAIT TO SEE THEM LIVE!!!!! !